Kyle has successfully connected a real IGT slot machine to a computer running Linux. The computer plays the game (simulating quarters) and records the payout (if any) to a SQL database. Soon the game will be online for people to play (not for money), and more importantly to record and calculate the odds of winning. Pretty neat stuff, and the whole project has progressed very rapidly. The co2 laser has arrived for the engraver. Some work has started to build an online radio station that will play music from Hampton Roads. Right now things are being worked out with the automation system. Next up will be the streaming system and web page. Then soliciting for content. Donkey Kong has been repaired, Ms Pac-Man has been moved to a switchmode power supply and will hopefully be stable. 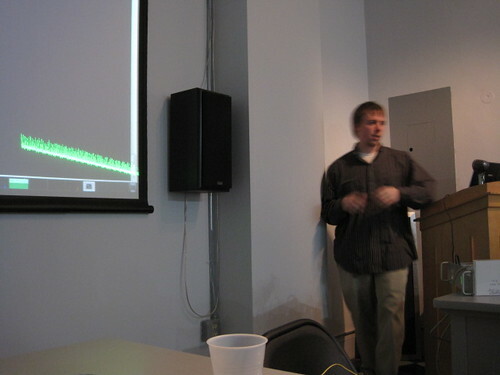 At HRGeeks ][ Matt Crainer gave a presentation on the progress of a laser pong game being developed. 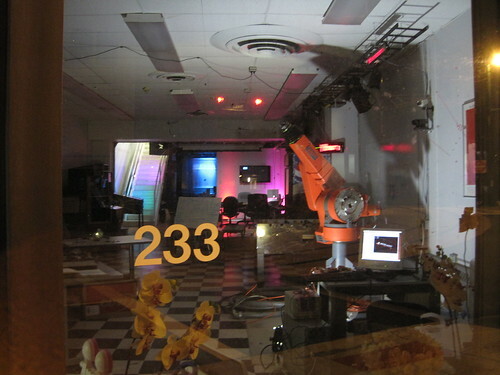 Our friend Ken Kurzweil donated a real, industrial robot arm to the lab. It's made by American Robot and is a Merlin model. We're a bit of parts from making it work, but we know where we have to go to make it run! This is an exciting addition to the lab. 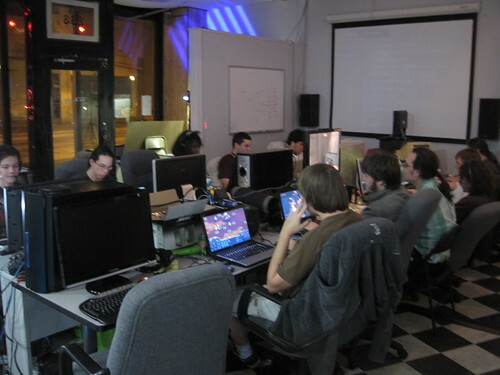 The Lan party was a new diversion from working on projects. It was fun, but won't be an every-month occurrence. I'm thinking we had 14 people playing. Also there are some new projects that are really active, props to Kyle! More public information on his work soon! Open hack night was another success. Vex was working on the laser engraver controller. Matt made some great progress with the laser-driven pong game (should be able to do a large building game of pong when this is done) and some other projects were going on. New people visited, new project ideas were formed, and we march on! Oh yea, it looks like the lab is getting a donation from a friend. An industrial robot arm. The real deal. Trying to source some needed components. More news on this in the very very near future. It's insanely cool.